Researchers have made solid progress in developing a viral therapy to silence a faulty gene in people with amyotrophic lateral sclerosis (ALS). In the September 6 Molecular Therapy online, first author Kevin Foust of Ohio State University in Columbus and colleagues report that they knocked down expression of the ALS gene superoxide dismutase 1 (SOD1) in mice and in non-human primates. The treatment could be applicable to people with SOD1 mutations, and possibly sporadic cases, Foust said (for SOD1 in sporadic ALS, see Alzforum News story on Bosco et al., 2010 and Alzforum News story on Haidet-Phillips et al., 2011). 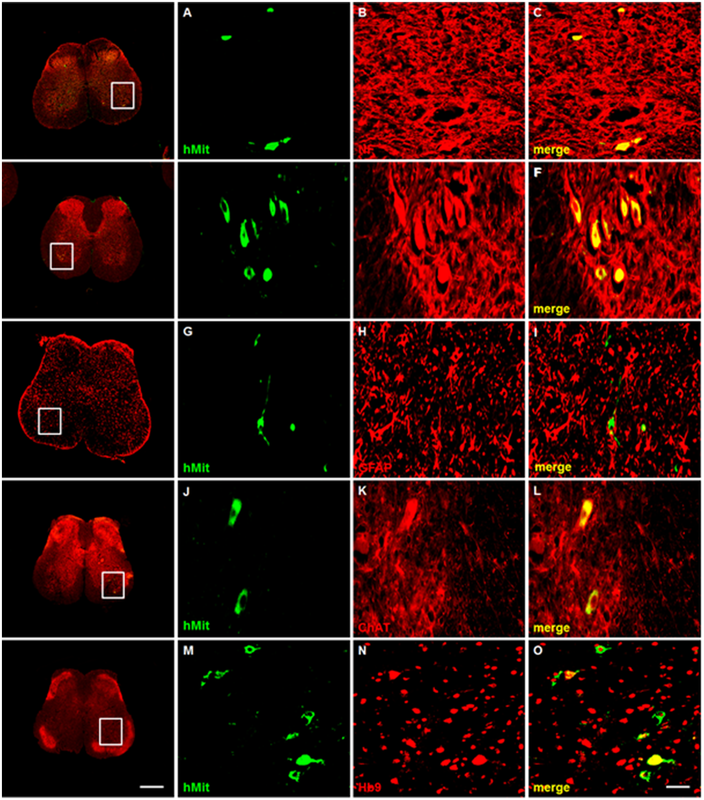 Viral delivery in primate spinal cord. 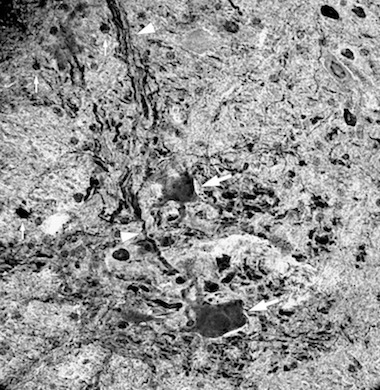 To test gene therapy delivery by AAV9, Kevin Foust and colleagues shuttled the gene for green fluorescent protein to the macaque spinal cord with this virus. All black areas represent GFP. The protein fills entire cell bodies and projections of neurons, particularly large motor neurons (large arrows). Arrow heads depict neurites originating from the GFP-positive motor neurons. The small arrows label non-neuronal cells in the spinal white matter that also contain GFP. Courtesy of Kevin Foust, Ohio State University, Columbus. Now, Kaspar and colleagues have published full results from two different mouse models expressing mutant human SOD1. They provided the treatment after symptoms began, and gained what in the field are considered major extensions of survival: one month for a fast-progressing model, and nearly three months for a slow one. “No one has slowed disease progression to this extent with a post-natal intervention,” Foust said. While scientists have tried viral-mediated RNA interference in mice before (Raoul et al., 2005, Ralph et al., 2005, Miller et al., 2005), the Foust group have taken a step toward human translation by testing their version in three cynomolgus monkeys, a type of macaque. The animals lost 87 percent of the SOD1 protein in their lumbar spinal cord within two weeks. The next step will be to optimize delivery in the monkeys and gather toxicology data, in order to propose a human trial to the Food and Drug Administration, Foust said. Foust’s plans are complementary to an antisense treatment for SOD1 that already is in human studies, noted Timothy Miller of Washington University in St. Louis, Missouri. Miller was co-principal investigator on that phase 1 trial (see Alzforum News story and Alzforum News story on Miller et al., 2013). The antisense works by a different cellular mechanism than shRNA, and was delivered without a viral vector. Thus far, the SOD1 antisense appears safe and the researchers are planning a phase 2 study, Miller said. One difference between the two approaches is that antisense RNA would require regular dosing, whereas the AAV9-delivered shRNA could, in theory, be a single treatment that would permanently modify the patient’s cells to block SOD1 translation. This could be both a blessing and a curse, Miller and Foust agreed. On the one hand, a single treatment would be more practical. On the other, should the viral-mediated gene therapy go awry, there would be no way to reverse it. With antisense RNA, doctors could simply stop infusions and let the nucleic acid fade away. Reference: Foust KD, Salazar DL, Likhite S, Ferraiuolo L, Ditsworth D, Ilieva H, Meyer K, Schmelzer L, Braun L, Cleveland DW, Kaspar BK. Therapeutic AAV9-mediated suppression of mutant SOD1 slows disease progression and extends survival in mouse models of inherited ALS. Mol Ther. 2013 Sep 6. Dec;21(12):2148-59. [Pubmed].